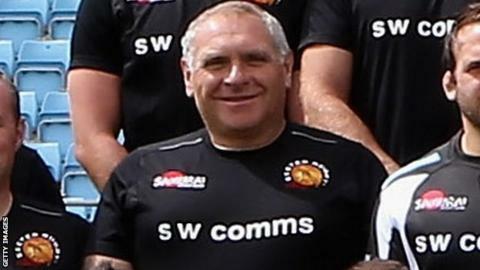 Former Plymouth Albion coach Simon Lane says his position was made untenable after new owners hired coaches from Exeter Chiefs to run the side in the wake of Graham Dawe's sacking. Chiefs academy coaches Rob Gibson and Sam Morton were brought in on Monday to assist in coaching the squad. "I couldn't see any real need to bring them in," Lane told BBC Sport. "The players are at the stage now where they could lead themselves for two games, if we're entirely honest." Lane and the rest of his coaching team resigned on Wednesday, leaving Gibson and Morton in charge. The National One club were taken over by former Albion players David Venables and Bruce Priday last week after entering administration. Dawe had been in charge of the side since April 2015 and had previously run the club from 1999 to 2011. "We've got a lot of respect for the way he put so much effort into helping secure the club on and off the field this year," added Lane. "With two games left, he gets cut and everything that we've worked for has been blown apart. "It's very sad for all of us. He put huge amounts of effort into making sure we've exceeded every resource we've had this season."